In physics the term "spring rate" is more accurately the stiffness coefficient of the spring. To determine experimentally the spring stiffness, you need to know Hooke's law: F=|kx|. To calculate the desired quantities it is necessary to measure the other two and then using the laws of mathematics, to solve an equation with one unknown. It should vertically to fasten the spring. Measure with a ruler the length of the spring before it hang the cargo during the suspension of weight on it. Calculate the difference of the lengths of the springs. It turns out that x = x1-x2, found elongation of the spring. Mounted on the spring any a weight of 100 grams. This weight acts on the spring with a force equal to 1 Newton. Therefore, the second value is already known. F= 1N. 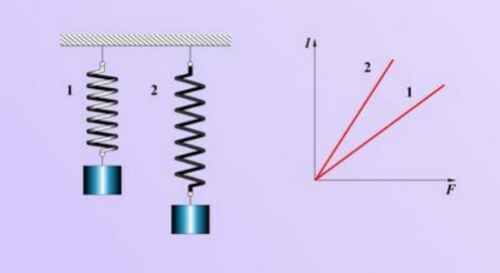 According to Hooke's law to find the stiffness coefficient of the spring, it is necessary to divide the tensile force of a spring on its lengthening. k=F/x. These two values are already defined empirically. The ruler measures the elongation in inches, if you apply the value found without translation to meters, you get the erroneous calculation of the stiffness of the spring. 4 cm= 4*0,01 = 0,04 m.
From the point of view of classical physics, a spring can be called a device, which accumulates potential energy by changing the distance between the atoms of the material from which the spring is made. Referring to the perceived load of the spring differenziata on: springs, compression springs, bending springs, torsion and spring tension. 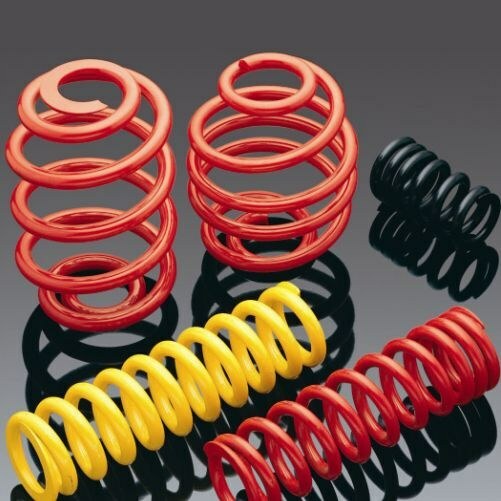 In characterizing each of these springs is of great importance to the ratio of its stiffness. Please note that during the deformation of the springs occurs the force tending to restore the original size and shape of the body. This force is caused by electromagnetic effects between the atoms and molecules of a substance from which made the spring. This force is called the elastic force. The simplest form – deformation tension and compression. Will mount vertically one end of the spring, the second end Express free. Use a ruler to measure the length of the spring: the result write down in a notebook, setting it to x1. Hang onto the free end of the spring gold load and re-measure its length. Obtained during the measurement the result write down in a notebook, setting it x2. Calculate the absolute elongation of the rod, which represents the difference between x2 and x1. At small strains or compressions of the spring the elastic force is proportional to deformation: it is aimed in the opposite direction from the movement of the particles in the body under deformation. That is, Fупр = |kx|, where k is the coefficient of rigidity. This ratio expresses the essence of Hooke's law. So to find the coefficient of rigidity of the spring, should the stretching force of the body divided by the elongation of the spring. Not knowing what is the tensile force of the spring, it is impossible to calculate the ratio of the stiffness, so find the stretching force. Elastic force or tension balances the force of gravity acting on the suspended load. This force arises solely under deformation of the body. So, Fупр = - N = -mg. It follows that mg = kx. And hence k = mg/x. Substitute the known values into the formula and calculate the coefficient of stiffness of the spring. Remember: substitute in the formula for the value transferred should be in the SI system. The stiffness coefficient of the spring depend on the material from which made the body, and spring length and shape. The coefficient shows how much force you need to apply to the body to elastically deform it to unit length. We are talking about elastic deformation, when the body after exposure to returns to previous form. To find this value, we need to deform the body, attaching a force or to measure the potential energy of deformation. Attach to the body of the load cell and pull it, deforming the body. Power that will show the dynamometer, will be modulo equal to the force of elasticity, acting on the body. Find the coefficient using Hooke's law, which says that the force of elasticity is directly proportional to its elongation and directed in the direction opposite to deformation. Calculate the stiffness coefficient by dividing the value of the force F on the extension of the x body, which is measure with a ruler or tape measure k=F/x. To find the elongation of the deformed body, subtract the length of the body is deformed from its original length. The stiffness is measured in N/m. If there is no dynamometer, hang to deformable body cargo known mass. Make sure that the body is elastically deformed and not destroyed. In this case, the weight of the load will be equal to the elastic force acting on the body, the coefficient for which you want to find, for example, springs. Calculate the stiffness coefficient by dividing the product of the mass m and the gravitational acceleration g≈9.81 m/S2 on the elongation of the body x, k=m•g/x. The elongation measure by the method proposed in the previous paragraph. Example. Under the weight of 3 kg and a spring of length 20 cm was 26 cm, determine its stiffness. First, find the elongation of the spring in meters. To do this, the length of the elongated springs, subtract its length in normal condition x=26-20=6 cm=0.06 and m. Calculate the stiffness using the formula k=m•g/x=3•9,81/0,06≈500 N/m. In the case where the known potential energy elastically deformed body, calculate its rigidity. For this additional measure its elongation. Stiffness will be equal to the doubled potential energy EP divided by the square of the elongation of the body x, k=2•Ep/x2. For example, if a ball is deformed by 2 cm and a potential energy of 4 j, then the stiffness k=2•4/0,022=20000 N/m.